Going through the website, I realized I've posted several vegetarian bì recipes but never showed how to make it with meat. Today, I made it with veal. A more authentic version would use pork meat, fat and skin. 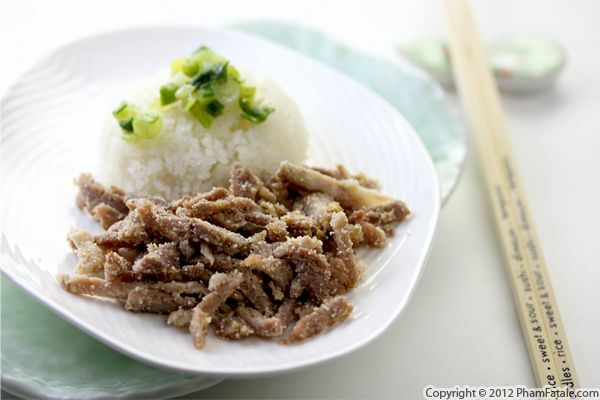 In any case, the meat is cooked, then shredded and tossed in a finely-ground dry-toasted rice powder mixture. This version is healthier than the original and every bit as tasty. It's eaten at room temperature. 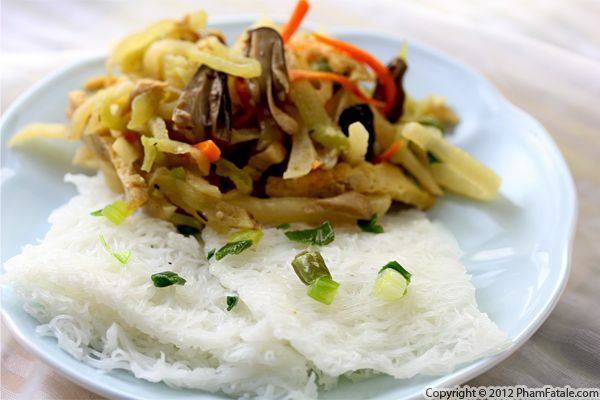 You can serve it with bún (cold rice vermicelli noodles), steamed cơm tấm (Vietnamese broken rice) or in bánh mì (Vietnamese-style baguette sandwiches). I usually accompany the meat salad with đô chua (pickled carrots and daikon), Vietnamese herbs, fresh sliced chiles, lime wedges, shredded lettuce or cabbage, cucumber and nước mắm dipping sauce on the side. It's a fairly easy treat, so give this recipe a try! Bánh hỏi is a Vietnamese specialty dish. 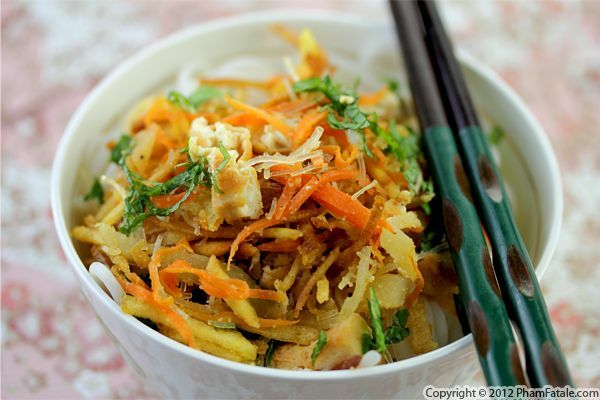 It's composed of very thin rice vermicelli noodles, often steamed and seasoned with fried green onions. They’re usually served with barbecued beef or pork but for my husband who's a vegetarian, I accompanied them with a combination of sautéed tofu, bamboo, jicama, carrots and straw mushrooms. That's why I call this dish bánh hỏi chay (hint: chay means "vegetarian" in Vietnamese). As a child, I remember having this dish at celebrations, though I don't really know why. I make it pretty regularly in our home because in my opinion, it's very simple to prepare and always enjoyable. 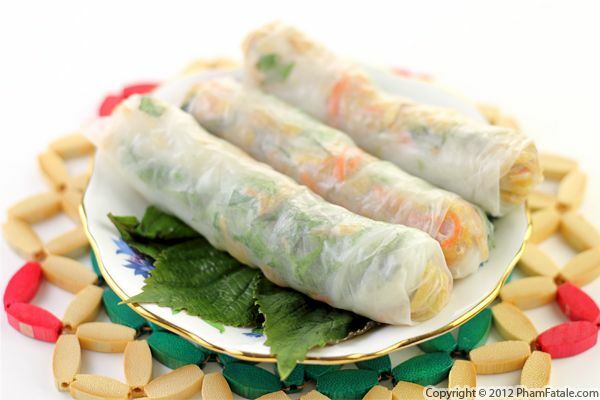 Spring rolls are traditionally made of sliced pork, boiled shrimp, rice vermicelli noodles and Vietnamese herbs wrapped in rice paper called bánh tráng. Since I cook for a vegetarian crowd every day, today I made “salad” rolls with sauteed carrots, beech mushrooms, shredded white cabbage, soybean sprouts, fried tofu and the usual rice vermicelli noodles, lettuce and Vietnamese mint. Served at room temperature with a vegetarian dipping sauce, they make the perfect summer entree. And speaking of summer, wrapping almost anything is a really great way to exercise portion control, which will do wonders for your bikini bod! For this dish I made a traditional bì chay with jicama, tofu, a protein element and soy sauce dipping sauce. Then I wrapped the tofu mixture in rice paper disks, forming tasty and healthy spring rolls. 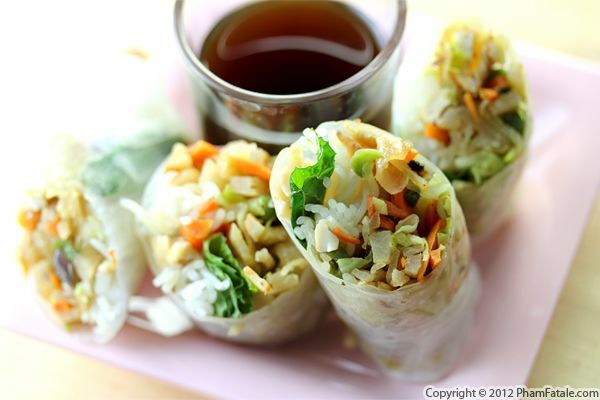 Rice vermicelli noodles, shredded lettuce and cucumber were added to form the rolls as well. Once you master forming the spring rolls, you can experiment with many different combinations of noodles, vegetables and protein. Just try to maintain the same ratio of ingredient types as in this recipe.